Barnaby Perks is an engineer who has specialised in the commercialisation of healthcare technology. Following a BSc in Mechanical Engineering and Economics and MSc in Biomedical Engineering, both from the University of Dundee in Scotland, he started his career in NHS hospital-based academic research at the University of Dundee before working in small business start-ups developing assistive technology products for people with complex disabilities. After leading the trade sale of two health technology businesses, Cambridge Adaptive Communication and GEWA UK, he transferred into a Global Strategic Marketing role with GE’s geospatial information software business. 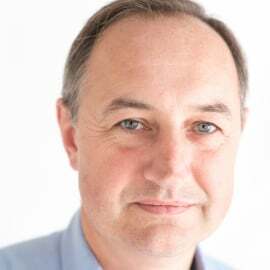 Barnaby joined Ieso Digital health (then PsychologyOnline) as CEO in January 2011, raising investment to start the company’s commercial journey following successful publication of clinical trial data in The Lancet. Barnaby has grown Ieso to become a significant provider of NHS-commissioned mental health services, delivering high quality, clinically validated and cost effective therapy.